Upon the death of Alexander the Great in 323 BC at the age of 32, the newly created Greek Empire fragmented. No one general or heir was strong enough to hold the support of the Empire intact. The throne of Egypt fell to Ptolemy I, the son of Lagus, a Macedonian of common birth. Ptolemy I had been a childhood friend and a trusted commander of Alexander the Great. He played a leading role in Alexander’s later campaigns in Asia. Following the death of Alexander the Great in 323 BC, Greek Empire was divided among the Diadochi (dìàd´ekì)(=successors) by the imperial regent Perdiccas. Ptolemy was appointed satrap of Egypt and Libya. In perhaps an attempt to strengthen his power, Ptolemy I stole the body of Alexander the Great, which had been embalmed and intended to be returned to Macedonia. Ptolemy sent a force to intercept the funeral procession and took the body back to Alexandria where he built a spectacular tomb. This political act reinforced Ptolemy’s claim to be Alexander’s successor as ruler. Trouble began when Antignos I the One-Eyed, a member of the Diadochi, attackedSeleukos I in 326 BC. Seleukos I had been alotted Babylon in 321 BC as his piece of the empire. Antignos I succeeded in taking the city and Seleukos fled to the court of his friend Ptolemy I in Egypt. This began the epic struggle between the Diadochi, which would consume much of their lives. Antigonus the One-Eyed, and his son Demetrius I (“the besieger”) (c.337-283 BC), were defeated at Gaza in 312 BC. Seleukos I thus succeeded in retaking his city of Bablyon marking the beginning of what would become known as the Seleukid Empire. In 308 BC, Demetrius I succeeded in defeating Ptolemy I of Egypt in a naval battle off the coast of Cyprus. In 305 BC, Rhodes was besieged by Demetrius I who employed some 30,000 workmen to build siege towers. Despite his greatest efforts, the siege failed. While Ptolemy I was prevented from holding Cyprus and parts of Greece, he succeessful in resisting invasions of both Egypt and Rhodes and occupied Palestine and Cyrenaica. In fact, it was the siege of Rhodes by Demetrius I that gave rise to the Colossus of Rhodes, which was the inspiration for the Statue of Liberty in New York donated by the French after World War I. The Colossus of Rhodes was completed by the sculptor Chares of Lindus after 12 years. It was made of bronze and portrayed the god Helios. The material came from the spoils left behind by Demetrius’ failed siege. In 305 BC, Ptolemy declared himself King of Egypt thus founding the Ptolemaic Dynasty of Egypt which lasted about 300 years until the death of Cleopatra VII in 31 BC when Egypt became a Roman province. Ptolemy I also became known by the title Soter (=”preserver”). Meanwhile, Seleukos I declared himself to be king of Bablyon also in 305 BC founding the Seleukid Dynasty of Syria. Lysimachus , another member of the Diadochi, declared himself the king of Thrace. Finally, in 301 BC, at the Battle of Ipsus in Phrygia, the ambitions of Antigonus came to an end. Antigonus was slain in battle at the age of 81 by the forces of Lysimachus and Seleucus I. Still, Demetrius I did not give up. He was determined to take the throne of Macedonia and rule Asia. A political alliance was then forged between Ptolemy I and Lysimachos. 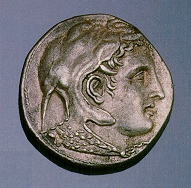 Ptolemy I gave his daughter by Berenike, Arsinoe II to Lysimachos in marraige around 300 BC. In turn, Lysimachos later gave his daughter in marraige, Arsinoe I to Ptolemy’s son Ptolemy II Philadelphus in about 288 BC. 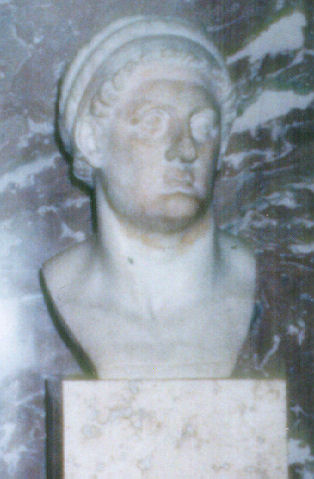 Thus, Lysimachos became the eventual grandfather of the future ruler of Egypt – Ptolemy III. With most of Greece and Macedonia now under his rule, Demetrius I once again looked upon Asia and the aging members of the Diadochi. His ambitions sparked the formation of another coalition by Lysimachus of Thrace and Pyrrhus, king of Epirus, with Seleukos I and Ptolemy I joining to block Demetrius’ plan to invade Asia. Finally, in 288 BC, Demetrius was driven out of Macedonia by Lysimachus and Pyrrhus. Demetrios was deserted by his troops and eventually surrenderd to Seleukos I in 285 BC, who kept him prisoner until his death in 283 BC. The first wife of Ptolemy I was Eurydice, the daughter of Antipater. His off-spring by Eurydice included Lysandra and her brother Ptolemy Ceraunus. His court was a den of plots and conspiracies between Eurydice and Berneike, who at one time was considered to be a mistress. In the end, it was the off-spring of Berneike that became the heirs to the throne Ptolemy II and Arsinoe II. When Ptolemy I rejected his son by Eurydice, Ptolemy Ceraunus, he naturally fled to the court of Lysimachus in Thrace where he joined his sister Lysandra who had married Agathocles, a son of Lysimachus by his wife Nicaea,. This unholy alliance would later prove to be a true Greek tragedy. Agathocles, was an adult, a successful general with children of his own. Ptolemy I was a man of many talents. His administration of Egypt was very much like a business, running the state strictly for profit. As a result, Alexandria flourished to become the most prosperous city of the Hellenistic world. Ptolemy I was a historian himself and the author of a lost history of the campaigns of Alexander. Because of his love of history, Ptolemy I founded the greatest libraryin the ancient world at Alexandria, his capital. The great library of Alexandria was built by sending agents abroad to buy or copy books. Every ship that entered Alexandria was searched for books which were either purchased or copied and returned. In this manner, the library expanded to half a million scrolls or books. The Ptolemys established a museum (temple of the muses) in Alexandria, which operated much like a modern university. Learned men and students were attracted there from all over the ancient world to teach or study. Seaborne trade flourished and a lighthouse was built on the inland of Pharos to guide ships into Alexandria harbour. It was one of the seven wonders of the ancient world. Under the guidance and patronage of a far-sighted Ptolemy I and his son Ptolemy II, Alexandria had become the literary, mathematical and scientific centre of the ancient western and near-eastern world, taking over the role previously enjoyed by Athens. It remained in that role for generations. Ptolemy I abdicated his throne to his son Ptolemy II in 285 BC shortly before his death in 283 BC. Ptolemy I Soter died peacefully in bed in 283 BC, one of the few survivors of Alexander to do so. Of surviving works of Ptolemy I, one still finds the temple of Kom Abu Billo, which was dedicated to Hathor “Mistress of Mefket”. Note: The portrait of Ptolemy I appears on an extensive series of coinage covering nearly 300 years. Most of the coinage of late Egypt displays the portrait of Ptolemy I with inscriptions denoting the current king or queen. This is true up until the time of Cleopatra VII.